Crafting which includes crocheting, cross stitch, sewing,etc. :, education especially special education. I thought these would be some interesting thing to make with the duct tape. Again, an individual could make some cool things with the college duct tape. Fold 6 inches of tape back onto itself so you create a non-sticky piece of neon duct tape. Cut and repeat for as many feathers as you’d like to create. To create your feather shape, sketch one directly on the tape or print out a photo or graphic of a feather, cut it out, and use it as a stencil on the duct tape. For a feathery texture, cut tiny slits in the duct tape feather at a slight angle, similar to the back slash button on your keyboard. Do this on both sides and along the bottom. Cut a few tiny triangle shapes out of the feather. Then, ruffle things up by holding each end of the feather and twisting a few times, until it has the look of a real feather. You need to attach them to earrings! 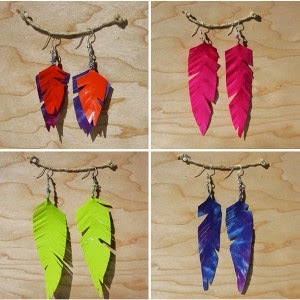 Grab your wire and cut approximately 3” off to wrap around the stem of your feather. Using a pair of needle nose pliers, hold the wire in place as you wrap it around the top of the stem. Be sure to leave a small loop on the top – this is where you’ll attach your earring hook. Wind the wire back down to the bottom of the stem and pinch with your pliers to hide the pointy end of the wire. Lastly, remove the hooks from a pair of tired earrings or from a couple strays that’ve lost their partner, and attach them to the wire loop at the top of each feather. 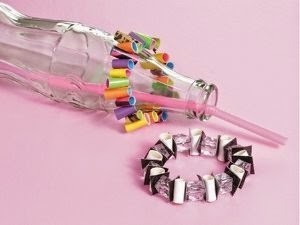 Make the Stretchy Bracelet, first wrap straws with tape. Cut a strip of duct tape 1.5" wide and the length of the straw, and roll around until straw is covered. Cut the covered straws into short pieces. Thread onto an elastic cord with a large-eye, sharp needle. You can also use beads and double-sided tape squares (.5" in size) for your bracelet. Knot the cord ends together. To make the Tape-Wad Bracelet, cut some elastic cord. Gently wad up scraps of tape & wrap around the cord, adding beads between the wads. Tie on pretty charms & pieces of old necklaces & earrings. Knot the cord ends together. Cut a strip of the Duct Tape® approximately 8 inches. Face the sticky side to cutting board and, with the ruler and hobby knife, cut 6-8 strips of angled tape. The large end should be no longer than a half-inch; the other end should taper down to a fine point. Repeat this step for each color. Take your straw and attach the large end of the tape base. Slowly roll the strip of tape over the straw, keeping the strip centered on itself when rolling. This creates your bead. Once you fill your straw with beads, cut them off one at a time. While cutting, keep your scissors up against the edge of the bead so none of the straw shows through. Repeat this for every bead you make. Measure (or just eyeball), the length of elastic you'll need and cut to the length that will fit your neck comfortably. At one end of the elastic band, attach a small piece of tape. This is to prevent beads from falling off the band when stringing them from the other end. Now string your beads one by one until the necklace is full. 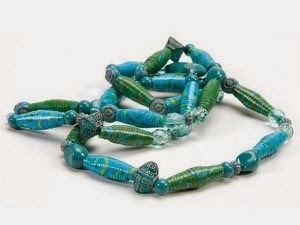 Once all of your beads are in place, cut off any extra elastic and tie both ends together in a knot. Share your ideas on this or anything here on the blog either here or e-mail me at stipple@verizon.net. I look forward to hearing from you! How to make a hedgehog! Messy Project Kids will love to do!